The fabulous four as January is coming to an end I thought I post about my favorite masks which have helped me deal with Past-Christmas breakouts and fighting dry, dull skin. Origins Drink Up Intensive Overnight mask: This is just the perfect mask for dry, dehydrated winter skin. I use it nearly every night either as mask or moisturizing cream. I doesn't break me out and my skin feels plumped but not greasy the next morning. It is packed with amazing ingredients (as Origins products always are) such as Apricot Kennel oil and Avocado oil and Mango butter to nourish the skin and Japanese seaweed which helps locking in the moisture. Next to it, it also smells amazing, fruity and fresh. 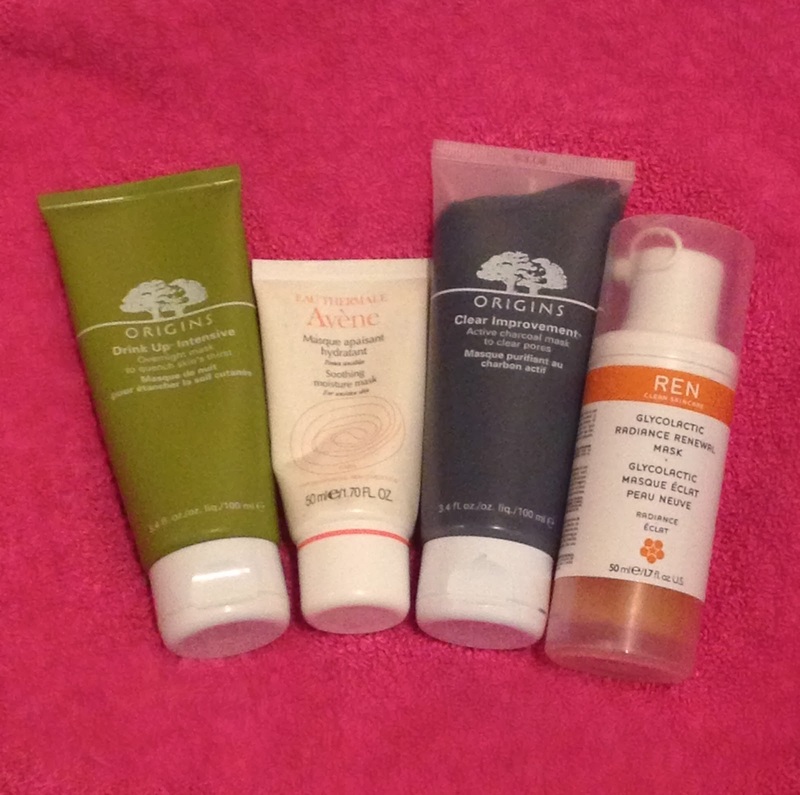 Avene Soothing Moisture mask: This one is an old favorite of mine. It's a great lightweight mask, which I love slathering on when I'm in a hurry. Origins Clear Improvements mask: As I'm writing up this post this little charcoal mask has already reached cult status in the beauty world, so I won't ramble on about this one too much. So let's get to the facts. This is the best mud mask I have ever used. Unlike most mud mask, this one leaves my skin plum and radiant after I manage to wash it off. The only warning I would give to people who suffer from acne, it probably will bring out any underlying spots at first thanks to the White China Clay. But if you can get past this stage, you soon will see a great improvement to the clarity of your skin. I use this once a week and apply it additionally on any break out areas as often as needed. REN Glycolactic Radiance Renewal mask: This mask was on my Christmas wishlist and after using it now for a month it's safe to say that it's AMAZING. I love when a mask does what it says on the tin. It effectively removes dead skin cells, which gives you a brighter appearance and it helps fighting blemishes and acne scars. I used to love the Alpha H Liquid Gold but I have to admit, this REN mask has taken its spot. Have any of you guys tried any of those masks? What do you think? What are your favourite masks? so the origins mask makes you break out first and then clears up your skin? ?